Near infrared surveys refer to multi- and hyperspectral data collected in the region just outside wavelengths detectable by the human eye. Near infrared wavelengths are generally considered to be between approximately 0.75-1.4 micrometers. "Near-infrared wavelengths behave similarly to visible light. Devices for sensing near infrared wavelengths are also known as night vision sensors. These sensors are useful in very low lighting scenes but cannot be used scenes with no light. Some animals such as nocturnal and deep sea animals have the ability to see in the near infrared spectrum." cannot be used as a page name in this wiki. Near-infrared wavelengths behave similarly to visible light. Devices for sensing near infrared wavelengths are also known as night vision sensors. These sensors are useful in very low lighting scenes but cannot be used scenes with no light. Some animals such as nocturnal and deep sea animals have the ability to see in the near infrared spectrum. "Near infrared surveys are those which measure radiation in the spectrum just outside of light visible to the human eye. The near infrared wavelengths are not usually scanned as a stand-alone survey; they are scanned along with other infrared and visible bands of the electromagnetic spectrum. By scanning multiple bands such as in multispectral and hyperspectral imaging maps showing land temperature emissivity, reflectance, and elevations can be constructed. A unique instrument that has been used for geothermal exploration activities is the Advanced Spaceborne Thermal Emission and Reflection Radiometer (ASTER). This instrument was designed by Japan and mounted on the U.S. Terra Satellite, launched in 1999.'"`UNIQ--ref-00000000-QINU`"' The instrument is capable of scanning in multiple bands from visible light and near infrared to long wave infrared." cannot be used as a page name in this wiki. Near infrared surveys are those which measure radiation in the spectrum just outside of light visible to the human eye. 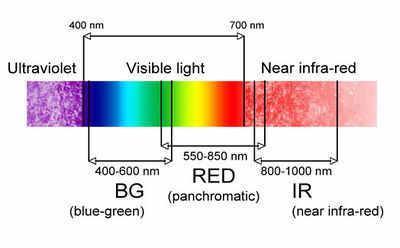 The near infrared wavelengths are not usually scanned as a stand-alone survey; they are scanned along with other infrared and visible bands of the electromagnetic spectrum. By scanning multiple bands such as in multispectral and hyperspectral imaging maps showing land temperature emissivity, reflectance, and elevations can be constructed. A unique instrument that has been used for geothermal exploration activities is the Advanced Spaceborne Thermal Emission and Reflection Radiometer (ASTER). This instrument was designed by Japan and mounted on the U.S. Terra Satellite, launched in 1999. The instrument is capable of scanning in multiple bands from visible light and near infrared to long wave infrared. [[Stereo Satellite Imagery|Stereo Satellite Imagery" cannot be used as a page name in this wiki. Electromagnetic spectrum: visible light, near infrared, and ultraviolet. Near infrared surveys are best conducted in conjunction with other electromagnetic bands during multispectral or hyperspectral imaging surveys. Near infrared wavelengths as a stand-alone survey would not provide much useful information for geothermal exploration; however the near infrared spectrum can be useful to scan in conjunction with other bands. ↑ Mariana Eneva (California Energy Commission). 2010. Geothermal Exploration in Eastern California Using Aster Thermal Infrared Data. N/A: California Energy Commission. Report No. : CEC‐500‐2012‐005. This page was last modified on 24 October 2013, at 09:57.